Recently, at Christie's in New York City, a Picasso painting was hammered at auction for a record-setting price of $179 million. 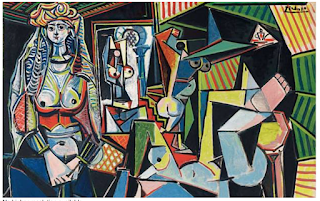 The painting is called Pablo Picasso's "Femmes d'Alger" (Version "O"). The last time the paining hit the market, it went for $31.9 million dollars in 1997, purchased by a European collector. However, the new buyer has remained anonymous. Originally thought it was Hamad bin Jassim bin Jaber Al Than, the prime minister of Qatar. But sources now say it is not him. It has been a busy and profitable week for auctioneers. Records are being broken, and high prices are being paid. Here is a quick rundown of recent luxury auction activity. A painting by Lucian Freud sold for $56.2 million at a Christie's auction. The painting was "Benefits Supervisor Resting." A 25 carat Burmese ruby set in a platinum ring accompanied by diamonds was hammered at $30.3 million at a Sotheby's auction. An auction house sold more than $1 billion of art in one week for the first time ever. That auction house was Christie's, which sold postwar and contemporary art.